This year’s Angling Trust Ladies National Championship saw forty five (45) anglers battle it out at the picturesque Weston Pools, Owestry. The England International Ladies were strong on the day and filled two of the top four places on the day with our own Sarah Taylor enjoying a particularly successful individual outting finishing in second place overall to qualify for next year’s ladies Fish O Mania final at Maver Hayfield Lakes! 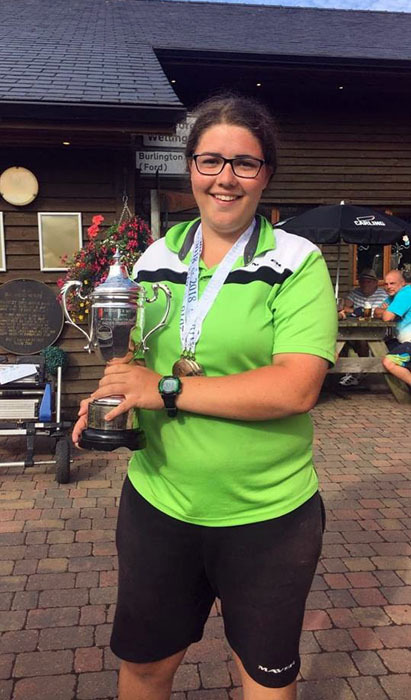 As well as qualifying for her first Fish O final, Sarah also retained the Claire Dagnall U21 Championship trophy in the process and finished second overall with the rest of the Lindholme Ladies team. Below, Sarah reflects on a very successful 2018 Ladies National Championship event. Sarah’s qualifies for next year’s Fishomania ladies final and retains the Claire Dagnall U21 Championship trophy. “It still hasn’t quite sunk in yet…“! “This year’s Ladies National took place at Weston Pools. I was able to put in a decent amount of practice ahead of this year’s event and made good use of the time I had. On the day of the match I drew peg 9 on Belvedere. After hearing the weights from Friday’s match, I wasn’t too pleased with being on this lake. However, when I got to my peg, I had a nice lily bed right in front of me at 11m – perfect“! “I decided to start short on a top kit plus one feeding 6mm fishery pellets to my left and right with a 6mm Dynamite low oil carp pellet on the hook. After half an hour and a couple of small silvers, I decided to go shallow to the pads where I had been feeding fishery 4mm’s since the start. This seemed a worthwhile change of tact, as I started to catch the odd F1, which were averaging around 3lb a piece“. “After two hours, I had around 42lb on my clicker, which I was happy with and was on track to make my target weight. However, midway through the match, the lake seemed to switch off. In fact, the same could be said for the complex as a whole with hardly anyone catching steadily for the next couple of hours with odd fish being caught“. “At this stage in the match, I was still hoping that the F1’s would feed shallow, but as much as I was relying of this, I had to be conscious not to force the peg just in case I completely ruined my chances”. “With about two hours to go, I decided to have a look on my F1 line, but started quite deep as I thought the F1’s might be a little reluctant to come shallow. I opted for a 4ft rig and used it straight over the top of where I’d been fishing. This worked well and I proceeded to have what was an incredible but strange last hour and a half of the match catching barbel at 4ft in 7ft of water. I wasn’t complaining though, as I was now steadily putting a weight together“. Sarah Taylor with the second place Ladies National trophy and medals. “Come the end of the match, I had 97lb on my clicker, which was a little off my target target. However, I was confident enough it was a good weight on the day as it hadn’t fished like it can for anyone on any of the three (3) lakes“. “At the weigh in, I weighed 46.375 kilo (102lb) to win the lake. I had no idea where this placed me overall. However, I had done much better than I thought I had“! “At the presentation, it was confirmed that I had come second overall! I was shocked to say the least. This also meant that I had retained the Claire Dagnall U21’s trophy. On the team front, the Lindholme Ladies finished in second place, so well done to the girls (Kayleigh Smith, Charlotte Gore and Leanne Jane Knott)“. “Finishing in second place also meant that I had been given a golden ticket straight to the 2019 ladies FishOMania final next July! I’m absolutely buzzing! After coming 7th by such a small margin last year, it’s great to have the opportunity to be able to compete in one of the biggest events in the country“! 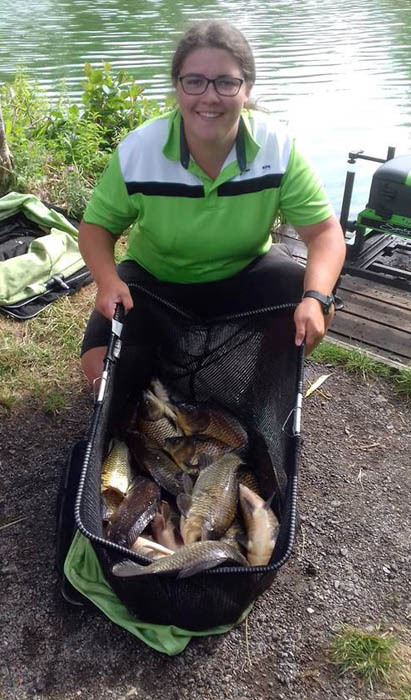 “A massive well done to Samantha Sim for the win with an awesome 57 kilos off Stretton 18“! “I want to thank Kristian Jones and Matty Dawes for all the information and help they gave me leading up to the event, as well as Ian Simpson for letting me sit behind him in a match and also giving me some useful pointers. Thank you to Mike and all the staff at Weston Pools Fishery for putting on one of the best nationals“! “Also thank you to Andre Grandjean and the others from the Angling Trust who gave up their time to organise the event. A very special thank you also to Steve Openshaw for his help over the last few months. My commercial fishing has really improved since his help and I really appreciate it!! Also thank you to everyone who has supported me over the years. I truly do appreciate every single one of you. Many thanks to Maver UK for their ever continuous support and faith in me“! From everyone at Maver, well done Sarah!